The Macedonian Stock Exchange (MSE) locally known as Makedonska berza is a stock exchange located in Skopje, Macedonia. Founded in 1995, It is the only stock exchange in the Republic of Macedonia. The main indices of the Macedonian Stock Exchange include – MBI 10 Blue Chip Index, MBID Index for publicly held companies and OMB Bond Index. If you are from Macedonia or if you are trading in Macedonian Stock Exchange, then I am sure you might be searching for Macedonian Stock Exchange Holidays, Macedonian Stock Exchange Trading Calendar. Below we have provided Macedonian Stock Exchange 2018 / 2019 Holiday Calendar. Note : Macedonian Stock Exchange (MSE) 2019 Holiday Calendar Coming Soon. Note : Macedonian Stock Exchange (MSE) 2019 Holidays List Coming Soon. 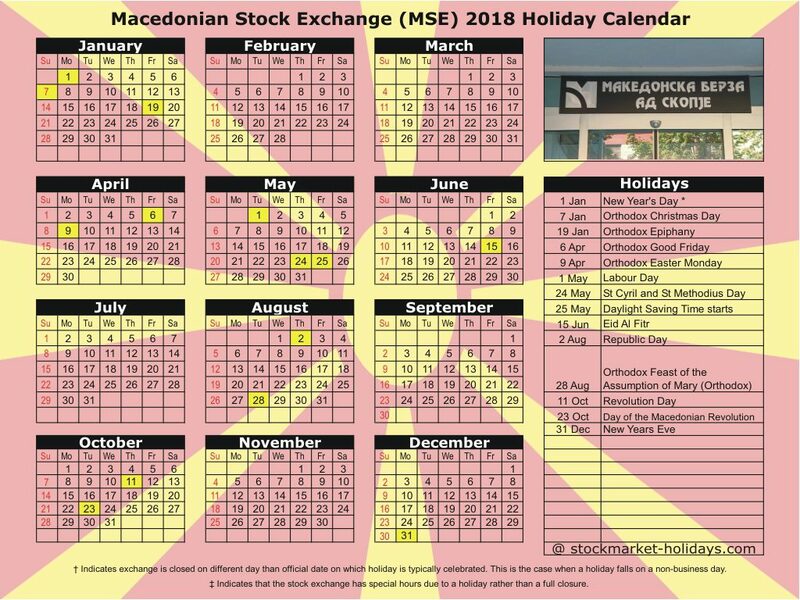 Note : Macedonian Stock Exchange (MSE) 2019 Holiday Calendar PDF Download Coming Soon. Live Quotes and Charts, Company Profile, Results, Corporate Announcements and all other information of all the securities trading on Macedonian Stock Exchange will be available on official website of the exchange.